The following four 1964 issued sets had been a mystery for many years as it had not been known for whom they were produced. As with the 1960 to 1962 sets, these sets do not appear in any of the retail price lists of the period and there is no further information concerning the sets in company records. So, again it was likely that they may well have been only marketed through some of the major department store chains and home shopping/mail order companies such as Simpsons-Sears and Eaton’s. Recent discoveries have now clarified the situation but for whom Set R.3 was made still remains unconfirmed. The surviving paperwork from several sets do provide us with an accurate year of manufacture. Also, it is most likely that each of these four sets were intended for the Christmas market. Each of the following sets, R.1 through to R.4, is basically a freight set based upon the ‘Transcontinental’ Diesel Switcher. Set R.1 is of a fairly standard composition. However, with the remaining three sets in the series the emphasis was very much on action models with high play value, as we shall see. None of the actual set name descriptions are currently known, indeed they may well not have been attributed by Lines Bros. themselves. The names that have been attributed to each set are purely notional but based upon actual set naming practice used in the catalogues and price lists of the period. The set was composed of the R.155 Yellow ‘Transcontinental’ Diesel Switcher, R.117 Oil Tanker, R.136 Long Box Car, R.126 Stock Car, R.115 Caboose, and oval of Super 4 Track (6x R.481 Straight, 8x R.485 Large Radius Double Curve, R.487 Power Connecting Clip and R.488 Uncoupling Ramp). The Instruction and Information Manual supplied with this set is stamped R1 310864 (31st August 1964). This set box has an original Simpsons & Simpsons-Sears label showing that the retail price was $24.95 Canadian. The set was composed of the R.155 Yellow ‘Transcontinental’ Diesel Switcher, R.136 Box Car, R.235 Pulp Wood Car, R.345 Side Tipping Flat Car Set, R.115 Caboose, and oval of Super 4 Track (6x R.481 Straight, 8x R.485 Large Radius Double Curve, R.487 Power Connecting Clip and R.488 Uncoupling Ramp). 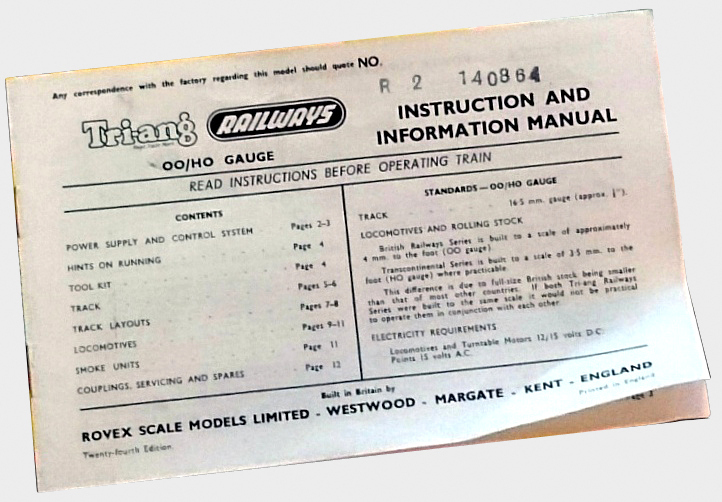 The Instruction and Information Manual supplied with this set is stamped R2 140864 (14th August 1964). Yet another ‘Military Special Set’; the third of its kind in a six year period. The set was composed of the R.155 Yellow ‘Transcontinental’ Diesel Switcher, R.216 Rocket Launching Wagon, R.249 Exploding Car, R.128 Helicopter Car, R.239 Bomb Transporter and oval of Super 4 Track (6x R.481 Straight, 8x R.485 Large Radius Double Curve, R.487 Power Connecting Clip and R.488 Uncoupling Ramp). The R.216 Rocket Launching Wagon is the last version of this model, with a pale blue coloured launching mechanism. The left end of the yellow box insert is embossed with ' CAN 3 '. At least two surviving examples of this set have been recorded. The price labels on the two Hudson's Bay Company R.4 Sets are very interesting. Looking closely at the second of the two price labels, the retail price is only $19.99 and there are scuff marks on the box lid behind it. The original full price sticker has been removed and this label has been stuck over the space. The $19.99 label is 100% genuine, which suggests that the price of this particular set must have been reduced to clear surplus stock which remained after Christmas 1964. The set was composed of the R.155 Yellow ‘Transcontinental’ Diesel Switcher, R.341 Searchlight Wagon, R.560 Transcontinental Crane Car, R.248 Ambulance Car, and oval of Super 4 Track (6x R.481 Straight, 8x R.485 Large Radius Double Curve, R.487 Power Connecting Clip and R.488 Uncoupling Ramp). 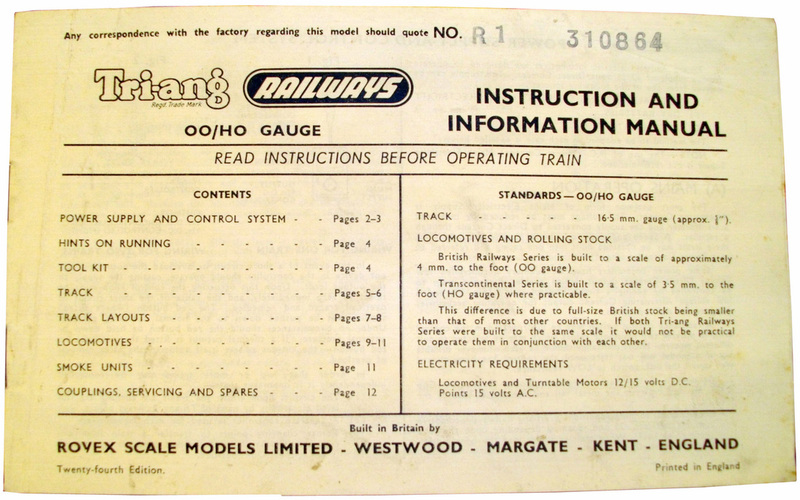 Two surviving Instruction and Information Manuals for this set are both stamped R4 100964 (10th September 1964). Full retail price was $26.88 Canadian.